ITREALMS: Smartphone addiction: 8 free apps to help-out! 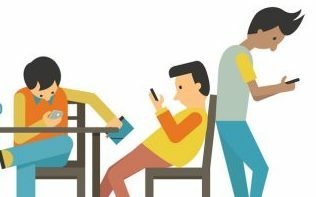 With the utility of smartphone devices increasing by the day, it is no surprise that smartphone addiction is on the rise among various classes and demographics of users. Latest findings by the Research and Development Unit of Yudala, smartphones have lent hitherto-unimagined ease and convenience to the increasingly fast-paced world we live in, such that the boundary of their innovative uses is constantly being pushed. However, the beauty of technology is the ability to use it to find solutions to its side-effects. So, if you are hooked on your smartphone, there are apps to help you deal with that. According to Yudala, here are a few apps that can help you break your smartphone addiction. 1.QualityTime (Android): QualityTime offers a unique and in-depth analysis of your smartphone activities by tracking total usage, screen unlocks and individual apps with hourly, daily and weekly summary reporting options. The app provides the ability to curb your habits by using actionable features allowing you to set your own time restrictions like ‘alerts’, ‘take a break’ and ‘scheduled breaks’. These features can help you manage and control your usage when needed. Also, you can create different QualityTime profiles to customize how you wish to unplug from your smartphone during “take a break” or “scheduled breaks” to minimize distractions during those periods. QualityTime profiles provide options for you to block notifications and reject phone calls with auto reply text messages. You can also define exceptions to allow incoming calls from important contacts and permit access to specific apps during those restricted periods. 2.Offtime (iOS, Android): The Offtime app helps users unplug by blocking distracting apps like Facebook and games, while also filtering communications. It includes information on how much you actually use your smartphone. You can choose tailored modes like Work, Family, or Me Time to ensure that you have access to the things you need, but aren't distracted by what you don't. Analytics of your phone and app usage can be an important wake-up call, and can help you curb your habits. 3.AppDetox (Android): Another useful application for breaking smartphone addiction, AppDetox can help you get your weakness under control, especially if you are one of those whose attachment to the smartphone is based on apps-usage. You can set your own parameters on an app-by-app basis so you can have access when it is not a disruption. Every time you break one of your own rules, the app reminds you to put down your phone. 4.Forest (Android, iOS, Windows Phone, Chrome, Firefox): Forest is a simple app that rewards you for not touching it. When you want to focus, open the app to plant a tree. If you want that tree to grow, don’t touch your phone for the next 30 minutes. That’s it. The mobile version encourages you to leave the app open, while the browser version gives you more flexibility: it encourages you to not browse sites from a block list you set for yourself. If you find yourself opening your Facebook, Twitter or Instagram tabs when you should be working, Forest is the right app for you. 5.Moment (iOS): Moment tracks your device usage and allows you to set daily limits. The beauty of the app is that it notifies you if you exceed them. You can even use a setting that "forces" you off your phone by flooding your screen with annoying alerts when you try to extend your screen time. Moment can also be used for families, with the option to track your family's device use from your own phone. 6.BreakFree (iOS, Android): BreakFree incorporates the usage tracking features found in many similar apps, but it differs in that it breaks down the information into an easy-to-understand "addiction score." It also shows you how often you unlock your phone screen, and comprehensively logs your usage for the day. This system makes it a great choice for those who like to set goals and challenge themselves. Ironically, it may also get you addicted to trying to see how low you can get your addiction score. 7.Flipd (Android): If you lack the focus or self-discipline to keep the phone away when you're trying to get some work done, Flipd is the app for you. Flipd allows you to lock your phone for a set period of time, and once you do, there's no going back. Even restarting your phone won't disable the app, so it is almost impossible for you to cut corners. Flipd can even be used to remotely "flip off" one user from another user's device, which is helpful for teams that want to keep one another focused on a task. 8.Stay on Task (Android): Stay on Task is an equally useful app which helps keep you away from your distracting smartphone in a gentler way. The app simply asks if you're still on task at random intervals during the day. If you are easily distracted, Stay on Task can help you overcome this weakness by redirecting your focus when your mind is wandering.